Let’s face it: website builders still have a poor reputation. People complain that their designs are ugly, they are low on functionality and inflexible. While this was true six years ago, times have changed. And to illustrate that we have a created a special video for you. Enter U2, one of the world’s biggest rock bands with a pretty much unlimited budget for their website. What if I told you that we were able to create an almost identical knock off version of their home page in only 36 minutes? All done using a free website builder and without a single line of code. It’s all here in this short video. From picking a template, to creating pages and adding media, right through to going live. We were even able to use functionality such as an event calendar and a polling widget. Here you can view the U3 website. We are, of course, in no way encouraging you to knock off other people’s (or famous rock band’s) websites, but merely to practice recreating a website you admire. You can then replace the elements with your own. This has two benefits: just the act of ‘doing’ will get you thinking creatively again, and it may also expose you to different ways of using elements in creating your own website. We used the Wix.com free website builder because it’s the most flexible website builder we’ve tested so far, and it’s particularly easy to navigate if you’re a visual type of person. 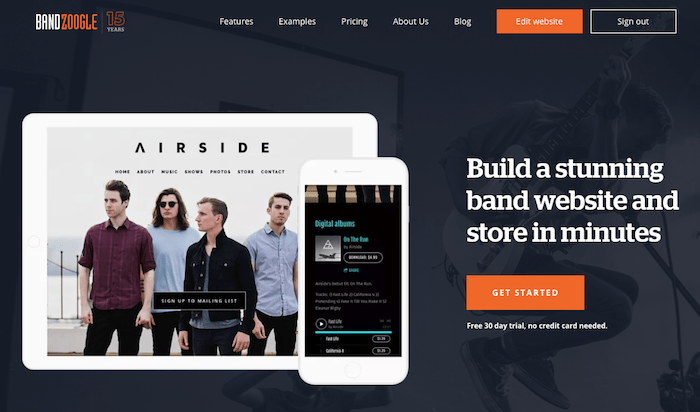 Which is the best website builder for bands? You don’t need to be U2 to benefit from having a web presence for your band. It’s one of the most effective ways to make your music available to your current (and future) fans. But since your main occupation keeps you pretty busy, you’ll need a system that is quick and easy-to-update. The best thing for bands and musicians is that Wix Music allows you to promote and sell music the easy way. It also has integration with many music stores and streaming services (e.g. Spotify, iTunes, Google Play, etc.). Furthermore, you’ll be able to reach your fans by email with their integrated newsletter tool. What’s more is that Wix truly allows for the pixel-perfect designs we showed you in our U3 video. You can plugin your social media channels with ease, as well as easily sell your merchandise in your own online store. While they feature a completely free plan, you’ll have to pay around $8 per month if you want an ad-free experience. This website builder was founded in Canada in 2003. Today they have over 20 employees and host several thousand websites. What’s unique about them is that they are solely focused on website creation for bands and musicians. Unlike Wix or Weebly they don’t offer a free plan, but you can try their system for free during 30 days – more than enough to see if you like it. It comes with modern-looking responsive designs – they’ll look good on any device. And although their range of features isn’t the largest, they have all the ones musicians, DJs and bands will need. For example, you can upload your tracks, sell your music online and even embed your Bandcamp player, Instagram feed or Bandsintown events. I have to say that their editor isn’t the most flexible as it works with predefined layouts (e.g. 1 column, 2 columns, etc.). But once you’ve used it for a couple of hours, you’ll find it easy enough to create several types of layouts and designs. Weebly is another good alternative to create your band’s website. They offer heaps of storage, their Pro plan (which is also around $8 per month) adds a custom music player and selling your songs and music is easy with Weebly’s online store. Their designs are slick too, however, you won’t be able to copy U2’s site (or any others for that matter) with as much accuracy as in our video example. What do you think about the U3 website? Please let us know in the comments!